Cresson Kearny (author of Oak Ridge National Laboratory's Nuclear War Survival Skills) has often said that inappropriate instruments in a nuclear emergency are "dangerous junk" not to be relied upon. "A survivor in a shelter that does not have a dependable meter to measure fallout radiation or that has one but lacks someone who knows how to use it will face a prolonged nightmare of uncertainties. Human beings cannot feel, smell, taste, hear, or see fallout radiation. A heavy attack would put most radio stations off the air, due to the effects of electromagnetic pulse, blast, fire, or fallout from explosions. Because fallout intensities often vary greatly over short distances, those stations still broadcasting would rarely be able to give reliable information concerning the constantly changing radiation dangers around a survivor's shelter. Which parts of the shelter give the best protection? How large is the radiation dose being received by each person? When is it safe to leave the shelter for a few minutes? When can one leave for an hour's walk to get desperately needed water? As the fallout continues to decay, how long can one safely work each day outside the shelter? When can the shelter be left for good? Only an accurate, dependable fallout meter will enable survivors to answer these life-or-death questions." "You are 'on your own' when buying a dose rate meter or dosimeter because no U.S. Government agency or other Government facility advises the public regarding sources of the best available radiation-measuring instruments for use in time of war, or warns concerned individuals that certain instruments are either incapable of measuring adequately high dose rates or doses for wartime use, or are dangerously inaccurate." What kind of instruments might not be appropriate to rely upon for your family's safety? An instrument that has very broad ranges such as "Low, Med, or High" will be of limited usefulness in a shelter situation where it is important to know the actual exposure rate. One current product's indicator is like a speedometer that only says whether you are speeding up or slowing down, but not how fast you're going. That instrument's "HIGH" alarm simply indicates that the radiation is something above 9R/hr, which could be survivable for up to a day, or fatal in minutes. At the higher levels it's vital to know specifically how strong that radiation is. An instrument that doesn't clearly tell its user the difference between such extremes is dangerous in a fallout situation. Expecting an inexperienced user to estimate the difference between these extremes by judging the rapidity of beeps is absurd. Professionals in the nuclear industry scoff at such overly broad ranges. The NukAlert's™ ten laboratory certified, calibrated measurement ranges allow it to function as a true radiation meter. It steps up in a doubling scheme from 0.1R/hr, 0.2R/hr, 0.4R/hr all the way to 50+R/hr. While the safe time is halved at each step. 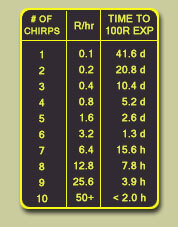 At the low radiation level you'd be safe to remain for well over a month and at the high end for only a couple hours. The 100Rem total accumulated dose shown here would be the threshold onset of radiation sickness, which is 100% survivable if not exceeded. Calibration claims are often made relative to easily generated radiation energies. One device that claims a 75mR/hr detection threshold actually required a 350mR/hr exposure with Cs137 gamma radiation to generate a response in our licensed calibration laboratory. It is likely that the unit was calibrated with X-ray radiation. The device's specifications offered no clue about the accuracy of any of its thresholds or their changes with various radiation sources. One key-chain unit claims a directional response, which is likely to be useless in a fallout situation, and raises the question of which direction the overall calibration is supposedly valid for. Even in a "dirty bomb" event the radiation is likely to be dispersed, limiting the usefulness of any directional effect. The sensible response to any nearby explosion is to move away from the blast, preferably not downwind. Civil Defense experts recognize that a nuclear emergency may become a period of prolonged disruptions, possibly with multiple attacks, rendering replacement batteries, especially specialized lithium batteries, unavailable. One marketed key-chain detector with a small replaceable lithium battery employs LEDs, high current beepers and excessive sampling that can rapidly consume the battery during alarm. Their otherwise detailed specifications fail to state battery life during alarm mode, which is the most critical application for any instrument. The design appears to have been driven by marketing and sales considerations rather than practical Civil Defense requirements. Some devices have their sensitive circuitry open to the environment in order to allow battery replacement, compelling one instrument's warranty to exclude water damage. Civil Defense experts recognize this as a double vulnerability. That is, radioactive contamination can enter the unit, rendering it ineffective; and an unsealed instrument cannot be decontaminated by washing it off. Instruments using a Geiger tube as the sensor are likely to be over-ranged and useless at the higher radiation levels encountered after a nuclear detonation. (The NukAlert™ has been tested in a 5000R/hr Cs137 gamma field, and it continued alarming flawlessly for the full 2 hour duration of the test. The NukAlert™ has also been tested & verified by the Naval Air Warfare Center for Electromagnetic Pulse immunity and meets MIL-STD-461D, RS105. "This is the most remarkable advance in civil defense equipment in many, many years. These are truly great devices." - Dr. Arthur B. Robinson Dir., Oregon Institute of Science and Medicine, Publisher of 'Nuclear War Survival Skills' book, Co-Author of the Civil Defense book 'Fighting Chance' (over 500,000 copies sold). © www.NukAlert.com 2003, 2004, 2005, 2006, 2007, 2008, 2009, 2010. All Rights Reserved. © www.RadShelters4U.com 2002, 2003, 2004, 2005, 2006, 2007, 2008, 2009, 2010. All Rights Reserved. © www.RadMeters4U.com 2001, 2002, 2003, 2004, 2005, 2006, 2007, 2008, 2009, 2010. All Rights Reserved. © www.KI4U.com 1999, 2000, 2001, 2002, 2003, 2004, 2005, 2006, 2007, 2008, 2009, 2010. All Rights Reserved.